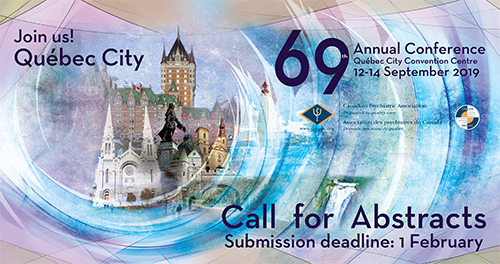 The Canadian Psychiatric Association’s 69th Annual Conference is scheduled for September 12-14, 2019 in Québec City at The Québec City Convention Centre. As you know, the Annual Conference is the largest psychiatric CPD event in Canada and we look forward to welcoming 1,000 delegates! The deadline for abstract submissions is February 1, 2019. Take advantage of the time saving online abstract submission process on the right. Please note that each course, symposium and workshop abstract will require the submission of three multiple-choice questions (MCQs), which will be used to develop a Section 3 self-assessment test. For more information, please review the 2019 Call for Abstracts below. Abstract submission deadline: February 1, 2019. Presentation types include courses, symposia, workshops, research papers and posters. Each submission must include a title, two literature references, three learning objectives and an abstract of 250 words maximum. Learning objectives must indicate what the participants will learn from the presentation in terms of knowledge, skills or attitudes. They must clearly describe what participants will be able to do differently after attending the session. Please consult the article, Writing Learning Objectives, for guidance. Please note that each course, symposium and workshop submission will require the submission of three multiple-choice questions (MCQs), which will be used to develop the Section 3 self-assessment test. MCQs should list the correct answer and two references for the answer. Please use the resources and tips for constructing multiple-choice questions. All presenters, discussants, chairpersons, and authors/co-authors must complete the full disclosure form. Audiovisual aids will be provided as requested on the submission, pending approval. The CPA will aim to meet all reasonable requests for audiovisual equipment, based on the type and duration of the presentation. Audiovisual aids not specified at the time of submission cannot be guaranteed. It is the responsibility of presenters to provide a laptop computer for use with an LCD. In keeping with the principles of Maintenance of Certification (MOC), a minimum of 25 per cent of the total presentation time must be allotted for discussion. Sessions will be monitored for compliance with this requirement. You will be notified of the Program Subcommittee’s decision regarding your submission by Spring 2019. All presenters and co-presenters must register for the conference and pay the appropriate registration fee. It will be assumed that the presentation will be made in the language in which the abstract is submitted. Financial support for part or all of the programming must be disclosed. Programming in the scientific conference must meet MOC accreditation standards. All sessions partially- or fully-sponsored by any organization that are submitted to the scientific program will be monitored for compliance with MOC requirements, and may be subject to additional levels of review. Further information about MOC and the accreditation process is available from the CPA head office. Go to http://ww1.cpa-apc.org/abstracts to access the online submission procedure. After an abstract has been submitted, a confirmation email with a password will be sent to the senior author. This password is required if online edits are necessary. Online edits will only be accepted until Feb. 28, 2019. The online system includes required fields and will not allow you to continue unless the information is included. The abstract will appear in the order in which it was submitted. We have two categories of posters: research poster and an early investigator poster. The research poster is our traditional category and can be submitted by anyone. The early investigator poster is geared towards medical students, students in other health care programs, psychiatry residents and early career psychiatrists (years 1-3), one of whom must be the presenter. It is CPA policy that all abstracts submitted for the annual conference are sent for blind peer review. The Program Subcommittee generally consists of 40+ peer reviewers who graciously volunteer their time to conduct blind reviews of all abstracts. Reviewers have specific areas of expertise within the psychiatric field as well as general psychiatry. Abstract reviews are conducted via an online system managed within the CPA office. This system only permits reviewers to view presentation type, title, abstract text, learning objectives, and literature references. All mention of authors and sponsorship information is removed to ensure a fair and concise review. Reviewers are expected to read all information and provide a grade, suggest a presentation type, and provide comments as needed. Abstracts accepted for the conference must meet a minimum grade of 75% (the average of reviewers’ grades). Higher ratings are associated with: new information in the form of data, a new theoretical or treatment approach, a new program description, full description of data, multicentred symposia that take advantage of the national conference to present diverse points of view, and clarity, cogency and specificity of abstracts. Lower ratings are associated with: old information, data to be “available at the time of the conference,” reports from a single centre or study, or a vague discussion of the importance of the topic area. You will be notified of the acceptance by Spring 2019. All presenters must register for the conference and pay the appropriate registration fee. If your abstract is not accepted in the format submitted, an alternate presentation type will be offered. All submissions accepted as papers will be entered in a competition for one of three R.O. Jones Best Paper Awards: first, second and third place. All submissions accepted as posters will be entered in a competition for one of three poster awards: first, second and third place. This pertains to the research category and the early investigator category. It is your responsibility to advise your co-authors of the acceptance of your submission. If you decide to withdraw the submission at any stage, please let the Program Chair know immediately. Common Reasons for Rejections: Abstracts did not conform to the specific instructions, abstract submission received after the deadline, multi-participant presentations were submitted in a disorganized fashion. 2019 ABSTRACT SUBMISSIONS NOW OPEN!